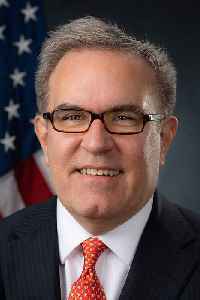 Andrew R. Wheeler is an American attorney and serves as the 15th Administrator of the United States Environmental Protection Agency (EPA). He served as the deputy administrator from April to July 2018, and served as the acting administrator from July 2018 to February 2019. He previously worked in the law firm Faegre Baker Daniels, representing coal magnate Robert E. Murray and lobbying against the Obama Administration's environmental regulations. Wheeler served as chief counsel to the United States Senate Committee on Environment and Public Works and to the chairman U.S. Senator James Inhofe, prominent for his rejection of climate change. Wheeler is a critic of limits on greenhouse gas emissions and the Intergovernmental Panel on Climate Change.